At Stone Temple consulting, the main areas of focus are content marketing, search engine optimization, and social media. As CEO and founder of the company, Eric Enge is charged with responsibilities like determining the future of the industry and a vision for the company and its clients, making Eric an authority on the aforementioned subjects. 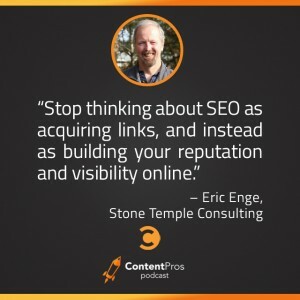 When analyzing these three deeply related topics, Eric seeks to debunk SEO myths that portray it as a cheap trick to increase website traffic rather than as a strategic part of strong marketing design. Redefining SEO, Eric cites the importance of both data-driven research and storytelling as two of the most important SEO determining factors in content marketing. Breaking it down in clear, mathematical, and data-supported ways, Eric explains how most of us have historically had SEO all wrong. Eric speaks to the importance of elite content, how page rank actually works, and why Facebook shares can be very misleading. He also reveals another facet of his personality that could come to the forefront, “Or I could sit back and do programming for a living again, because it’s really cool to solve those kinds of problems and sort of just geek out, because at the end of the day, once a geek, always a geek, I think, is a fair characterization of who and what I am.” Not a bad characterization at that.